This photograph was probably taken in the mid 1930's. Stillman is to the right of the picture. His brother, Andy, is on the left. Margaret remembered that Dad and Uncle Andy did some construction work together. 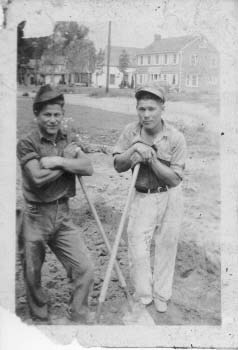 Dad was also in the CCC's, but it was unlikely that this photograph is from his CCC experience. Andrew Woodrow Cook was killed in action during World War II in the Philippine Islands.